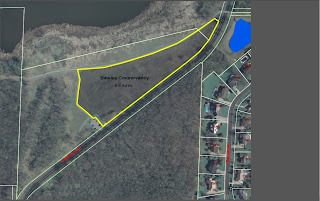 A second presentation will take place at the Allied Dunn’s Marsh Neighborhood Board meeting on Saturday, May 4, 12:00 noon, Revival Ridge Community Room, corner of Allied and Jenewein. At this meeting, Elizabeth Doyle, mosaic artist and, Reginald Baylor, a graphics, light and sculpture artist will be making presentations. Neighbors are invited to attend either or both presentations. Also expected to attend this meeting are Mark Vesperman, WisDOT project manager; Joe Bunker, Strand Associates, consultant project manager; Ken Saiki (mentioned above); and Karin Wolf – City of Madison, Art Program Administrator. 2 - Vandals have hit the garden shed in Marlborough Park for a second time and the Little Free Library on Whenona Drive for the third time. If you are within sight of either facility, please keep your eyes peeled for these vandals. Please call 911 if you see vandalism taking place, and take notes on the appearance of the person or persons you see. Please also let the DMNA know if you have any idea who might be doing this. This notice is brought to you by the Dunn’s Marsh Neighborhood Association. Earth Day, started by Wisconsin’s U.S. Senator Gaylord Nelson in 1970, will be celebrated in our neighborhood with a marsh clean-up this SATURDAY, APRIL 20. Show up at 9 a.m. at Apache Pond, Apache and Crescent Rd. Many more environmental events are happening on that same day. 8 - They Promise: Artists Will Attend Community Meeting on May 1. ALL Come! Wake up the kids! Feed them a nice breakfast. Everybody, kids and adults, put on your work gloves and boots. Then traipse on down to Apache pond. It’s just down Apache Drive from Marlborough Park. Why? 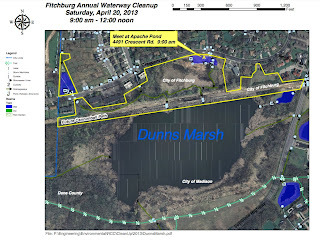 It’s time for the annual waterway litter pick up around Dunn’s Marsh. 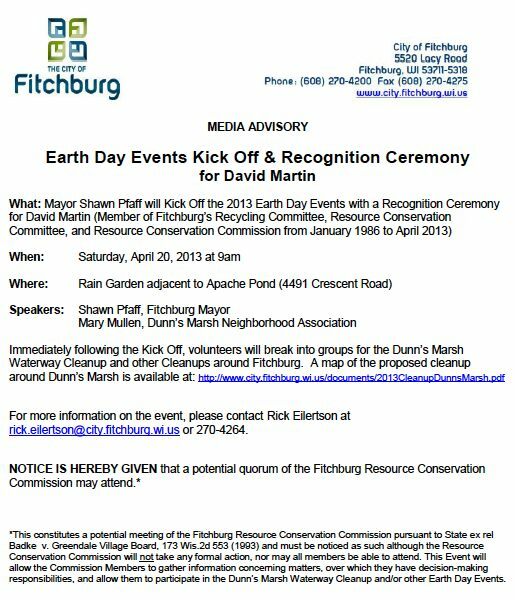 And this time, there will also be a short kick off to honor our neighbor David Martin who has put in decades on Fitchburg environmental committees. If you haven’t met Fitchburg’s Mayor Pfaff, it’s a chance to make his acquaintance too. 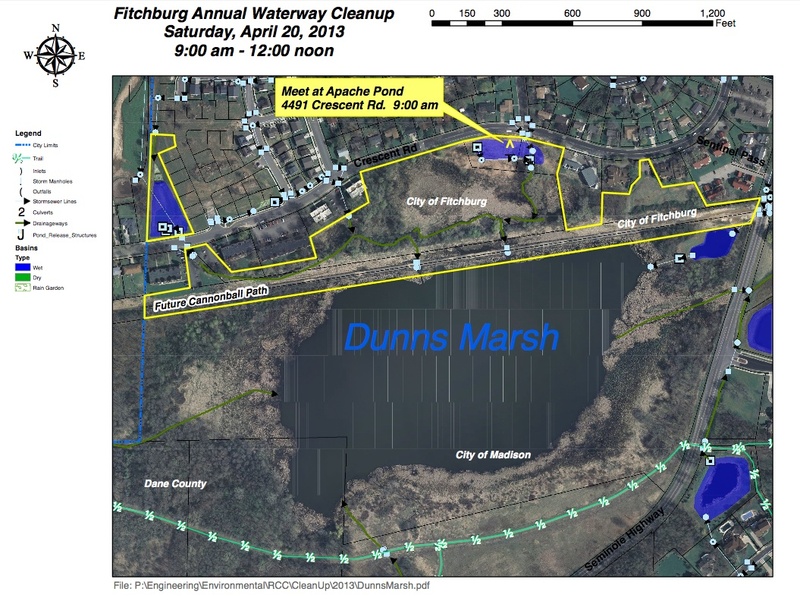 Immediately following the short ceremony, volunteers will break into groups for the Dunn’s Marsh Waterway Cleanup. Fitchburg will provide refreshments and a tote bag or T-shirt to participants. Volunteers are encouraged to wear boots and bring work gloves. Please be forewarned: Restroom facilities are often not convenient to this area. 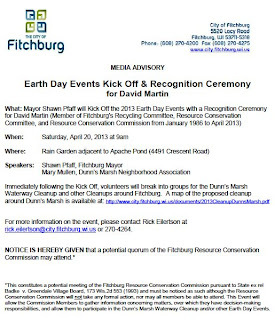 Fitchburg, Oak Bank, Pellitteri Waste Systems, and Surplus-IT have scheduled Fitchburg’s Spring 2013 Electronics Recycling Shred Day Event on Saturday, April 20th. Up to 5 bankers boxes of confidential paper documents can be shredded and recycled FREE of cost. Free! : Computers, LCD (Flat panel liquid crystal display) Monitors, Printers, Stereo Equipment, Media (cds, dvds, floppy disks, magnetic tape, etc. ), lead acid and other recyclable batteries, Styrofoam Packing Peanuts. Please contact Lee Shinefield (Surplus-IT) at 209-8000, lee@surplus-IT.com <mailto:lee@surplus-IT.com> or Felipe Avila, at 270-4277 or felipe.avila@cityfitchburg.wi.us <mailto:felipe.avila@cityfitchburg.wi.us> with any questions about the electronics recycling. A knock on the door at 10 pm on a Sunday night can be cause for concern. Turned out it was Fitchburg Alder and County Supervisor Dorothy Krause. She had noticed demolition equipment up by the Montessori School. She was worried. Would the pretty wooden fence just get knocked down and consigned to oblivion? Would the building be destroyed windows, doors and all without the chance for salvage? That’s what seemed to happen last year with the Burr Oak Center at the corner of Whenona and the Beltline Frontage Road and with the Highlander Motel at the corner of Verona Road. DMNA reps had spoken to WisDOT with dismay about this wanton destruction. Come Monday morning, it was time to act. 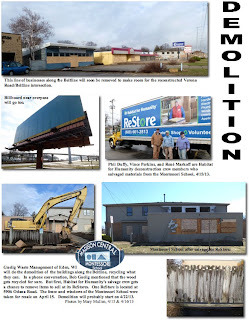 I consulted my notes from the April 3 DMNA community meeting and found the names of the Habitat for Humanity contact, Frank Byrne, and the demolition company, Guelig of Eden, WI. I hoped to put the two organizations in contact with each other about the fence. The names had been provided by Mark Vesperman of WisDOT and Joe Bunker of Strand Associates. Then I got to the computer. I found the contact information for Guelig’s Waste Removal and the e-mail address for the Habitat’s Mr. Byrne. I dashed off a letter to Frank Byrne of Habitat. My e-mail sailed through cyberspace at 8:01 a.m.
Then I quickly drove up to the site and pasted a sticky note on the door of the big machine that had already splintered part of the fence at the entrance to the Montessori building. “Call me about the fence,” I put on the note. Got to cover all the bases, I thought. After placing the note, I took some photos and reconnoitered the buildings all along the strip. Then it was time to head home. Back at the computer, I checked my e-mail. I breathed a sigh of relief. But the story isn’t done with yet. Later when I was passing by, I noticed the Habitat for Humanity ReStore Truck on the blacktop by the Montessori School. I pulled into the parking lot and got some photos of the crew. One man, Vince Perkins, mentioned that he was a longtime resident of the neighborhood just across the Beltline. When I asked about the fence, they said they weren’t taking it. This still isn’t the end of the story. The next day I got a call from Bob Guelig of the demolition company. He was responding to the note I’d left on the wrecking equipment. I expressed gratitude that they had contacted Habitat for Humanity. Bob assured me that during demolition they would be sorting materials, and he mentioned specifically that the wood is to be recycled. “The contract requires recycling,” he said. Here’s a final reuse story. 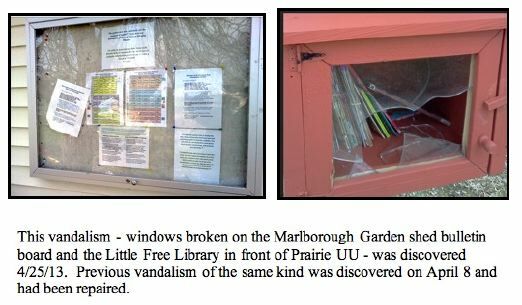 If you read the last Dunn’s Marsh Neighborhood e-News, you saw that vandals had broken the window of the Little Free Library in front of Prairie UU Society. At the Montessori School I’d noticed some heavy plexiglass lying loose on the site. “I wonder if I could take that piece of plexiglass to repair the Little Free Library window?” I said. It was very heavy, ¼-inch thick, practically indestructible. “Yes, I’ll give you permission. You may take it,” he said. Repair is scheduled for this Saturday when Prairie UU Society has a work day. It’s sad to see these once-thriving neighborhood entities disappear - a school, a business that makes limbs for those who’ve lost them, a hair restoration business, a stained glass craft store, a security business, an uphostery and fancy clock business - but the silver lining is that the recycling process that’s been described to us is “working” and some of the materials will be reused. The Habitat ReStore Deconstruction Team provides removal of salvageable materials from your home or business. As a locally recognized and respected organization, we offer efficient service and experienced personnel to complete your job on time. Using the Habitat ReStore Deconstruction Services is an environmentally smart choice. By diverting tons of usable material from our local landfill, we can lower our carbon footprint in our community and provide a smart alternative for our limited landfill space. Proceeds from the sale of donated materials support the mission of Habitat for Humanity of Dane County to provide affordable housing. Deconstruction volunteers are scheduled on an as-needed basis. Weekly commitment is appreciated but not required. If interested, contact Kathleen or call 661-2813. We are covered by an umbrella policy that covers all employees and volunteers on site. Certificate of Insurance is available upon request. Facts In 2003, an estimated 170 million tons of usable building related construction and demolition debris was produced in the United States. According to the EPA, only 48 percent of this debris was recovered for reuse or recycling. One Person’s Trash… …Could be another person’s treasure! Stop by the Habitat ReStore and look through our inventory of Deconstruction items. We gave salvaged treasures such as antique hutches and a beautiful stained glass window from deconstruction sites in the past. Habitat ReStore Deconstruction Services promote and encourage the diversion of materials from the landfill. The March 29 issue of the Dunn’s Marsh Neighborhood e-News carried information on how explosives, acids, and firearms are recycled. A future issue will describe how other dangerous materials are disposed of. The original articles from Earth 911 contain numerous links to further information, sometimes including videos. As a known carcinogen, asbestos is no longer permitted for use in the U.S. But before 1978 <http://www.epa.gov/asbestos/federalbans.html> , the material was widely used for a variety of applications, from walls and insulation to adhesives – meaning there’s still plenty of it around that needs to be disposed of properly. The most common way <http://sti.srs.gov/fulltext/ms2000194/ms2000194.html> to dispose of asbestos is to wet the material, seal it with plastic and transport it to a regulated chemical landfill. But in recent years, cutting-edge technologies are emerging to recycle the hazardous material rather than simply burying it away. By heating asbestos to high temperatures in a process called vitrification <http://sti.srs.gov/fulltext/ms2000194/ms2000194.html> , the material can be converted into harmless palex or borosilicate glass for use in ceramics products – creating a range of new options for asbestos disposal. Note: Although our ability to recycle asbestos is growing, you should never try to remove or recycle asbestos yourself. The best thing to do when confronted with the material is to contact a specially licensed asbestos abatement company for proper disposal. Lead in good condition is not considered hazardous, but lead from paint chips or dust can be dangerous if not handled properly. Today, about 80 percent <http://www.ila-lead.org/lead-facts/statistics> of lead is used in lead acid batteries (such as car batteries), which are readily recyclable. Additional uses for lead include radiation shielding, cable sheathing and lead sheet used by the building industry. All totaled, about 90 percent <http://www.ila-lead.org/UserFiles/File/FS_Recycling.pdf> of lead is used in readily recyclable products, and almost all of it is recycled in the U.S. Although it may sound like tricky business, recycling lead is not all that different from reprocessing other metals. They may be produced for safety, but fire extinguishers can be tough to recycle. For starters, the contents are under high pressure and may explode if the tank is punctured or the contents are mixed with other materials. Very old fire extinguishers may also contain carbon tetrachloride <http://www.mass.gov/dep/recycle/hazardous/fireex.htm> , a known carcinogen. However, the tank of a fire extinguisher is made of highly-recyclable steel, while the spraying mechanism contains brass and plastic. So, how are fire extinguishers recycled? Dry chemical extinguishers <http://www.sc.edu/ehs/modules/Fire/06_drychem.htm> can be discharged <http://www.mass.gov/dep/recycle/hazardous/fireex.htm> , and then the casing can be recycled with scrap metal. Carbon dioxide fire extinguishers <http://www.sc.edu/ehs/modules/Fire/05_co2.htm> are refillable <http://www.mass.gov/dep/recycle/hazardous/fireex.htm> and should be refilled after each use. Contact your local fire department or a fire extinguisher recharging company in your area for details. 4. New Dane County Clean Sweep Facility Opens – Wed., May 1 at 7 am, Dane County Landfill Site (7102 US Hwy 12 & 18, Madison) – Dane County will officially open its new Household Hazardous Waste Collection Facility on May 1, 2013. Read More <http://www.city.fitchburg.wi.us/documents/GreenE-NewsBlast23.pdf <http://www.city.fitchburg.wi.us/documents/GreenE-NewsBlast23.pdf> > ... Please contact (608) 243-0368 or visit www.danecountycleansweep.com <http://www.danecountycleansweep.com <http://www.danecountycleansweep.com> > for additional details. 5. Fitchburg Center Farmer’s Market Opens – Thurs., May 2, 3 to 6pm, Agora Pavilion (5511 E. Cheryl Pkwy) – Shoppers can find a host of Wisconsin grown produce, fruits, flowers, cheese, meats, organic options, baked goods, preserves, fiber and gluten-free items every Thursday (3:00 – 6:00 p.m.), through October 24 at the Agora Pavilion. Read More <http://www.city.fitchburg.wi.us/documents/GreenE-NewsBlast23.pdf <http://www.city.fitchburg.wi.us/documents/GreenE-NewsBlast23.pdf> > ... Save Gas. Buy Fresh. Buy Local. Contact Steven.leverentz@fitchburgcenter.com or 608-277-2592 for further details. 6. Fitchburg Green Thursday – “The Great Squeeze” - Thurs., May 2, 6:30pm, Fitchburg Library (5530 Lacy Road) – "Although our actions for the past 150 years have lifted our civilization to new heights, it has come at a tremendous price. We are now at a point where humanity's demands for natural resources far exceed the earth's capacity to sustain us. Read More <http://www.city.fitchburg.wi.us/documents/GreenE-NewsBlast23.pdf <http://www.city.fitchburg.wi.us/documents/GreenE-NewsBlast23.pdf> > ... More information on Green Tuesday and Thursday events scheduled throughout Dane County can be found at: http://www.tnsmonona.org/green-tuesdays-green-thursdays/ <http://www.tnsmonona.org/green-tuesdays-green-thursdays/> . 8. Container Gardening Workshop – Sat., May 11, 1-2 pm, Fitchburg Library (5530 Lacy Road) – This presentation discusses various types of containers to use in gardens, including some wall and hanging planters, plant selection, planting media, watering, fertilizing, and container designs. Jonathan Patz, MD, MPH will be speaking at West High School about climate change on Wednesday, May 1 at 7:00 p.m. in the West High auditorium. Dr. Patz is a Professor & Director of the Global Health Institute at the University of Wisconsin in Madison. He served as a lead author for the United Nations Intergovernmental Panel on Climate Change (or IPCC) – the organization that shared the 2007 Nobel Peace Prize with Al Gore. Dr. Patz co-chaired the health expert panel of the US National Assessment on Climate Change and was a convening lead author for the United Nations/World Bank Millennium Ecosystem Assessment. He devotes significant efforts to public science communication, contributing to a 2008 Time Magazine article, an HBO Documentary "Too Hot Not to Handle," and numerous state and local news reports on emerging issues in environmental health. Dr. Patz’s commitment to preventative medicine and environmental sustainability guide his personal lifestyle. Madison is very fortunate to have Dr. Patz as a member of its broader community and fortunate that he has offered to share his expertise. His presentation at West High is open to the public and is sponsored by West HOUSE Connection, a division of the West High School PTSO. The West High auditorium is located off of Regent Street. If you attended the April 3 community meeting to discuss art that will be part of the Verona Road reconstruction project, you were probably sorely disappointed. Instead of being presented with artists or possible kinds of art as advertised, the audience of neighborhood residents, DMNA Council members, and 3 alders listened to a recounting of the schedule for preliminary road work related to the Verona Road project. (See the next article for that information.) Apparently, due to the short deadlines, the possible artists weren’t yet on board. That issue should be remedied early in May. The DMNA has scheduled yet another community meeting to hear presentations about art and to discuss preferences. The meeting is Wednesday, May 1, 7:30 p.m., at Prairie UU Society, 2010 Whenona Drive. ALL RESIDENTS ARE INVITED TO COME AND MAKE THEIR WISHES KNOWN. If you can’t come to that meeting, the same presentation will be made at the Allied Dunn’s Marsh Neighborhood Association meeting. It is held on Saturday, May 4, 12:00 noon, in the Revival Ridge community room, corner of Allied Drive and Jenewein Road. 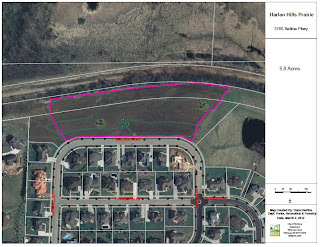 The dance that will end with a completely redone Verona Road and associated changes on the Beltline and Seminole Highway continued as WisDOT’s Mark Vesperman and Strand Associates’ Joe Bunker reviewed the latest plans that will affect our neighborhood this summer. They spoke at a community meeting sponsored by the DMNA on April 3. The duo covered a number of construction sites: the west side of Verona Road, the Beltline frontage road in front of the Arboretum, the Seminole Highway bridge, and more. Here’s what to expect this summer. · Starting July 8 and continuing into mid-August, the eastbound on-ramp to the Beltline just east of Seminole will be closed, and the frontage road there will be one way going east (no westbound travel on that frontage road, but one can exit the Beltline to Seminole as usual). The reason is that the frontage road will be shifted one lane closer to the Arboretum. · Once that frontage road work is done, the Seminole Highway bridge will be closed for three months for reconstruction Closure will continue until mid-November. · From July until October, the Verona Road southbound lanes will be resurfaced. Night work will occur from 10 p.m. through 5 a.m.
· From July through October, the “Freeport Connection” will be constructed. This will start with moving the Southwest bike path so that it goes on the west side of the pillars holding up Verona Road. Then a road will be constructed where the bike path is. 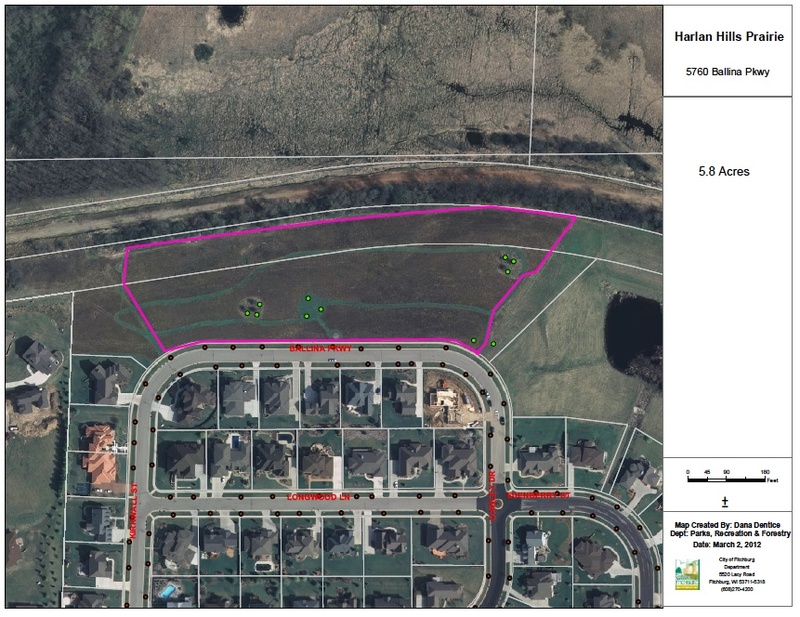 This will connect Allied Drive and the Frontage Road to Freeport Road and the frontage road on the west side of Verona Road. · During 2013, a number of intersections will be improved to handle the traffic that will divert to them as people avoid construction on Verona Road. A signal and turn lane extensions will be installed at Seminole Highway and Sentinel Pass. An eastbound left turn lane extension will be put in at County PD and Seminole Highway. At Seminole Highway, Yuma, and Nakoma Road, a signal will be installed and the pavement markings will be revised. At Seminole Highway and Lacy Road turn lane additions will be constructed. 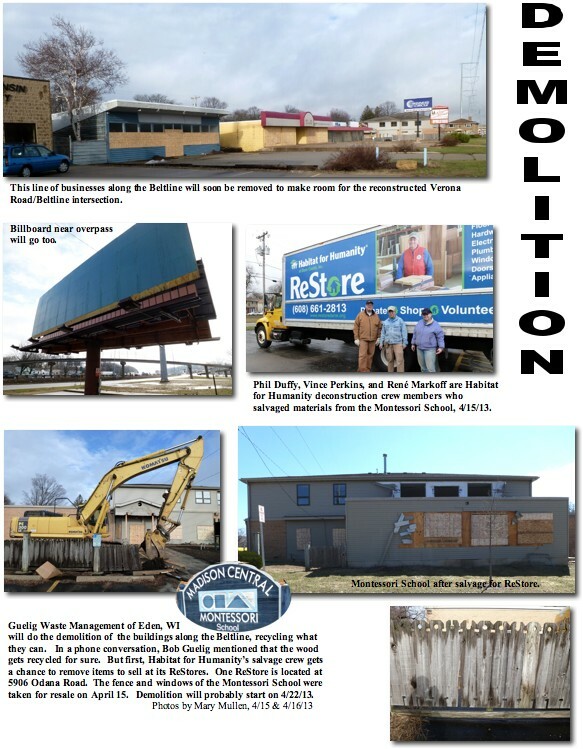 · Buildings will be demolished that are in the path of road construction. In April and May, three buildings will go down along the Beltline Frontage Road in our neighborhood. In addition, Kentucky Fried Chicken on the other side of Verona Road, and one building on Hammersley Road will be taken. All buildings slated for demolition will be gone by the end of the year including multi-familyunits on Midvale. Vesperman and Bunker also mentioned that a bike bridge will be built across PD to accommodate the Military Ridge Trail. Noise walls will also be constructed along the Beltline, a short one where the Highlander Motel used to be and another much longer one on the other side of the Beltline. Neighbors at the meeting were concerned about protection from highway noise. An earthen berm to be constructed as part of the new and longer bike-ped bridge will create some noise blocking, but the noise walls only protect residents right next to them. In other words, residents a couple of hundred feet beyond the noise walls or on the higher ground of Crawford Drive probably will hear just as much as they do now. Art was discussed to some extent. It appears that nothing at all about the neighborhood will be visible to motorists passing by on the Beltline or Verona Road. Art will only be visible from within the neighborhood. It could possibly be metal art on the chain link fence or wrap on bus stops (like the advertising wrap on city buses). If there’s any art on the sound walls, it would be on the inside facing our neighborhood. Come to the May 1 community meeting where we’ve been told some prospective artists will come to show the kind of work they do. We’ll have a chance to speak up then. The meeting is Wed., May 1, 7:30 pm at Prairie UU Society, 2010 Whenona Drive. How do people like us get influence over what happens with our neighborhood? One way is to get to know our political representatiaaves and to invite them to neighborhood meetings. If you haven’t met them in person, it also helps just to know what they look like. Check out the attachment to see Fitchburg alders Dorothy Krause and Carol Poole being sworn in at the Fitchburg City Council meeting on Tuesday and Madison 10th District Alder Maurice “Mo” Cheeks beiing sworn in to the Madison City Council. Swearing in and taking up their duties happened on April 16. All three alders also attended the April 3 community meeting sponsored by the DMNA. That’s the meeting that was supposed to deal with art for the Verona Road project, but instead mainly gave WisDOT and its consultant Strand Associates a chance to update us on what’s coming down the road this summer as the project commences in earnest. More bad news…. Forecasts Wednesday through Friday call for three more inches of rain. Unfortunately, Madison Parks will have to extend the ban on play on our parks, athletic fields and turf. The grassy areas in the parks are not in condition to handle large numbers of people. This ban is for all grassy areas in the parks, not only the athletic fields. Please stay off. When games or practices are played on fields with poor or unsafe conditions major damage to the fields can result. Afterwards, it can take months, or even years, for the fields to get back into quality playing condition. Madison Parks asks that team practices and pick-up games refrain from being played on the fields and parks until we give notice that it is safe to be on the fields. Any team violating this ban will be assessed damages. If you see any teams out playing in the parks, please call the Parks Manager on Duty at 239-7187.Staff will evaluate the conditions of the fields on Monday, April 22. Madison Parks thank you for your understanding and patience! The emerald ash borer (EAB), a non-native beetle that has been killing ash trees throughout the Midwest and Canada, has recently been found less than 30 miles away in Janesville. It has not yet been discovered in Dane County, but it will most likely be here in the near future, if it is not already here. Once established, EAB will kill all ash trees that are not protected with an approved insecticide. To prevent this devastation to our ash population, the City of Fitchburg has purchased special equipment to inject insecticide into the city-owned ash trees. However, the city budget allows us to save only 160 of our approximately 800 public ash trees. The remaining ash trees in parks and along streets will eventually be removed over a 5-year period (as set forth in Fitchburg's EAB Readiness and Response Plan)—unless they are treated against EAB. You can help save them! Participate in the Save-an-Ash program. Don’t forget–your trees are providing environmental and property value benefits. To calculate them, visit www.treebenefits.com <http://www.treebenefits.com/ <http://www.treebenefits.com/> > . You can help save ash trees in your community by sponsoring their treatment to protect them from EAB. Adopt a park or street ash tree or make a general donation to the program. Read our brochure <http://www.city.fitchburg.wi.us/departments/cityHall/parksRecreationForestryNaturalResources/forestry/documents/Save-an-AshBrochure.pdf <http://www.city.fitchburg.wi.us/departments/cityHall/parksRecreationForestryNaturalResources/forestry/documents/Save-an-AshBrochure.pdf> > to participate in this brand new program! Learn more at http://bit.ly/save-an-ash <http://bit.ly/save-an-ash> or attend an informational meeting next week (see below). The Forestry Division will be hosting an emerald ash borer informational meeting for residents and other property owners. The purpose is to give you a better understanding of the future implications of the tree-killing beetle on the Fitchburg urban forest and what you can do about it. Pick a session to attend! More than 100 species of native grasses, prairie plants, ferns, woodland flowers, shrubs and trees will be available for purchase at the Friends of the Arboretum Native Plant Sale on Saturday, May 11 from 9 a.m. to 2 p.m. under the tents next to the Arboretum Visitor Center, 1207 Seminole Highway in Madison. The selection this year includes favorites such as trillium, pale purple coneflower, little bluestem and prairie dropseed as well as a new prairie species, wild senna (Cassia hebecarpa). It flowers in mid-summer and thrives in medium to moist soil, and even clay. All plants are native to the area, and once established require minimal care. Species are suited for a wide range of growing conditions -- sunny or shady, wet or dry, sandy or heavy soils. No plants are dug from the wild. All proceeds from the sale benefit Arboretum programs. It is an honor and a privilege to serve you and the varied interests of the 77th Assembly District. It is very important for me to stay in touch with you on issues that personally affect you, your family, and our community. I welcome your feedback and will continue to work here in the legislature toward our shared goals and values by promoting job growth, strengthening education, and protecting our treasured natural resources. These are all key investments in the future of our community and our state. I've developed this electronic newsletter to provide a simple but direct way to communicate with you about my work as your legislator. I will be sending out updates on a monthly basis. To unsubscribe, please respond to this message with "unsubscribe" in the subject line. A number of my constituents contacted me about the laws Wisconsin implemented last session that allowed hunting and trapping in state parks and established a hunting season for wolves. As many of you know, I voted against both of these measures. I don’t see any reason to have wolf trapping and hunting seasons in Wisconsin. Wolves were removed from the Endangered Species List just last year. Proponents of the hunt said it would be very unlikely that hunters would be able to kill many wolves without using dogs. They were proven quite wrong when the dogless wolf season last fall closed about two months early because the allowable quota of wolves had already been reached. Last fall, the Department of Natural Resources (DNR) developed a set of proposed rules to govern the hunting and trapping seasons in parks. Under the DNR plan, state parks would have been open for hunting and trapping from October 15 until just before Memorial Day. In response to a tremendous amount of public opposition, the Natural Resources Board modified the rules and significantly reduced the seasons for hunting and trapping in parks. The new plan called for trapping and gun hunting seasons from November 15 to December 15 and from April 1 through the end of the third spring turkey hunting season (about the end of April). Bow hunting would be allowed in state parks from November 15 until early January. So please be aware that there may be hunting activity in state parks for the rest of this month. Additionally, I thought you might be interested to know that there will likely be a question about hunting and trapping in state parks and several questions about the wolf hunt, including the use of dogs, at the spring meetings held by the Conservation Congress. These hearings are held in every county of the state to obtain public input on various environmental matters and elect delegates to advise the DNR on natural resources issues. However, it is mainly hunters and not members of the general public who attend the hearings, so the vote results often have a pro-hunting slant. I strongly encourage you to attend the hearing in Dane County so that there is a wider representation of viewpoints offered. This year, it will be held on Monday, April 8 at 7:00 p.m. in the Performing Arts Center at Sun Prairie High School, 888 Grove Street. For more information about the hearings and to view all the questions that will be considered, go to Spring Hearings. As we learn more about the bombings in Boston, the tragedy becomes that much more real. Clearly, our thoughts and prayers go out to the individuals and families that have been devastated by this senseless act. Sadly, there are those that will seek to capitalize on our sympathy through scams on the internet. Please read the attached bulletin from Homeland Security that provides guidance on how to prevent becoming a victim of this type of fraud. There are many legitimate established charities that are in place to help in these type of situations. Please carefully research them before making a donation so that your good intentions result in positive action. The Risk: The bombing of the Boston Marathon, 15 April 2013, does not just mean an increased threat level across the country and globe, but includes new and recycled Internet scams. Major events tend to attract malicious individuals who use the event for their gain. The Threats: Internet watch groups and cyber security experts have already identified multiple fake domains/websites, and charity efforts taking advantage of the Boston Marathon bombing. Based on previous tragedies, more scams will follow in the coming days. Internet users need to apply a critical eye and conduct due diligence before clicking links, visiting websites, or making donations. Actors with unknown intentions registered over 125 domain names associated with the Boston Marathon bombings and victims, in the hours after the incident. The majority of these new domains use a combination of the words “Boston,” “Marathon,” “2013,” “bomb,” “explosions,” “attack,” “victims,” and “donate” and should be viewed with caution. More domains are likely to follow. Malicious actors are using social networking websites to spread hoaxes, including information regarding the purported death of several child runners (children are not allowed to participate in the Boston Marathon), and injured runners purportedly running for a variety of charities and causes. Multiple fake charities were created on social networking websites within minutes of the explosions purporting to collect funds for victims. Traditionally, these websites are scams. · Be cautious of emails/websites that claim to provide information because they may contain viruses. · Do not open unsolicited (spam) emails, or click on the links/attachments contained in those messages. · Never reveal personal or financial information in email. · Do not go to untrusted or unfamiliar websites to view the event or information regarding it. The information provided above is intended to increase the security awareness of an organization’s end users and to help them behave in a more secure manner within their work environment. Organizations have permission and are encouraged to brand and redistribute this advisory in whole for educational, non-commercial purposes. For more information regarding potential cyber threats please visit the Center for Internet Security website at CISecurity.org. 17 - Texting & Cyber Bullying Discussed by Officer Hanson, Madison Memorial H.S. Yowls and sharp howls woke neighbors in the middle of Tuesday night/Wednesday morning. At first it was clear that one or more tomcats were doing the yowling, but later a coonhound was seen trotting around back yards giving voice like he might have been hot on the trail of a raccoon. Disturbed neighbors are talking about calling the Humane Society. City of Madison ordinances prohibit free-running pets. If you are the owner of one of these animals, it would be a good time to rein in your cat or dog. Or if you know the owner, please let that person know that some neighbors are getting tired of losing sleep. Most of us never expect our beloved pets to be lost or stolen. The reality is that accidents do happen, and when they do, many owners are unprepared. Last year Dane County Humane Society (DCHS) received 1,047 dogs and 1,831cats brought to the shelter as strays. According to Animal Service Officers, the two biggest reasons for losing a pet are children and workmen inadvertently letting them out of the house or yard. 71% of those dogs and only16% of the cats were returned to their owners! Many more pets could have been reunited with their owners had they been microchipped and/or tagged. A microchip is the best way to reunite lost pets with their owners because tags can get separated from the animal. The combination of a tag and microchip give the best of both worlds by providing a visual ID and an implanted ID. Have your veterinarian check your chip yearly to make sure it remains up to date and in place. No pet should be allowed outside its house without identification. Microchipping can be done on a walk-in basis whenever the shelter is open or by your veterinarian. During National Pet Week, April 21-27, DCHS will be offering a $15 microchip and $5 ID tag special at the shelter on 5132 Voges Road. No appointment is necessary. Please go to the DCHS website (giveshelter.org) for directions and more information or call 608-838-0413. Vandals have hit Marlborough area community resources at least 3 times since March 29. Targets were a Little Free Library, the community garden shed in Marlborough Park, and a bus stop sign. Neighbors are asked to keep an eye out for the misguided person or persons who are doing damage and may strike again. Early birds on Whenona Drive the morning of March 29 found the Little Free Library at Prairie UU Society torn off its post and lying on the ground. The library box itself was not hurt at all. It was put back up within 2 days. Then on April 8, sometime between 2 p.m. and 7 p.m., that same Little Free Library was vandalized again. This time a brick had been used to shatter the plastic window. Both the brick and the shards of the window were found underneath the LFL. 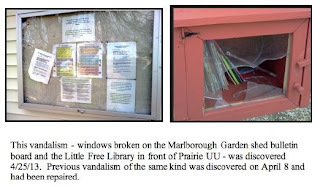 Prairie UU Society, this LFL sponsor, has reported the vandalism to police. Probably the same day, April 8, vandals attacked the garden shed on the Marlborough Park Community Garden site. Gardener James Luscher discovered the damage and photographed it. “When I was walking back from Boy's and Girl's Club this evening (Scrabble tournament) something about the garden shed looked 'odd' so I walked over instead of heading directly for my plot. The rear window of the shed has been severely damaged,” he said. In an e-mail, Mr. Luscher reported the vandalized shed to Micah Kloppenburg of the Community Action Commission. Mr. Kloppenburg filed a written report to the police. CAC is the garden lessee. While all this damage has been reported to the police, the perpetrators are unknown at this time. We all need to be alert so they can be caught the next time they attempt to destroy our neighborhood amenities. Read article #4 to learn how to best report vandalism. Madison Parks playing fields and turf conditions have gone from bad to worse. We know that the spring rain is a welcome sign after last year’s drought, but the drought conditions did create poor turf conditions. Add to that a long winter, cabin fever – people just wanting to get outside and play, and this week’s forecast that calls for more rain and cooler temperatures is creating a perfect storm of fragile athletic field and turf conditions. The Madison Parks athletic fields are utilized and reserved for many sporting leagues throughout the year. The leagues have paid to reserve and use these fields for their league play. If the fields are torn up now, the fields will be unsafe and the leagues will not be able to play on them because of the time it takes to repair the damage. This has a cascading effect on field scheduling for the rest of the year. Violators of the ban are being assessed for the damages caused this spring. If you see any teams out practicing or playing on the Madison Parks athletic fields, please call the Madison Parks Manager on Duty at (608) 239-7187. Ed Marshall, our new community liaison officer, suggests that a crime in progress should be reported to 911. But if damage is done and no one is in sight, call the West Police District number, 608-243-0500. There are many other options for reporting if a crime is not in progress. Several are noted here. Or you may pick up a paper Self-Report Form from the West District Police Station although that is very distant from our neighborhood. 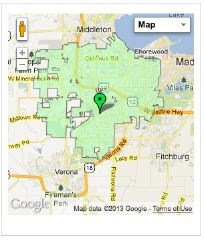 (The Madison part of our neighborhood is in the West District.) The West District is located at 1710 McKenna Blvd. The West District is shown on the map at right. The Dunn’s Marsh Neighborhood is just south of the Beltline on the far east edge of the District. This month (April), weather permitting, the City of Fitchburg will be conducting prescribed burns at a number of park and natural areas . 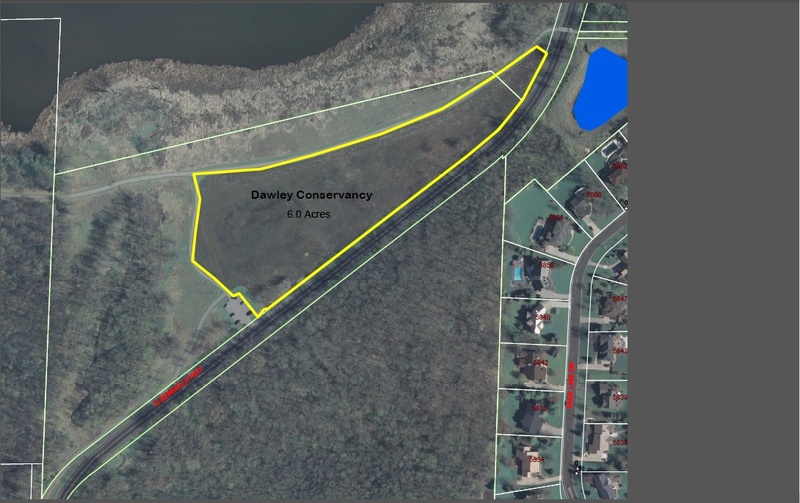 Two will be in or near the Dunn’s Marsh Neighborhood - one on the Dawley Conservancy south of Dunn’s Marsh and the other on the east side of Seminole Highway in Harlan Hills. The burns will be conducted by Adaptive Restoration Environmental Consulting, the company the City has hired to care for its prairies and conservancy areas. Adaptive Restoration will provide up to 24 hours advance notice of the burn, and they will notify all appropriate authorities prior to the burn. Their burn crew consists of trained firefighters with all the equipment necessary to keep the fire under control. In preparation for the burn, Adaptive Restoration will be mowing or cutting vegetation around the areas to be burned as necessary. These temporary paths will be used to contain the fire within the park. For more information, please contact Fitchburg City Forester Ed Bartell at 608-270-4289 or Mike Healy, Restoration Ecologist with Adaptive Restoration 608-554-0411. 6 - Bus Hearing, Thur. April 11, 6:30 pm, Fitchburg Community Center, 5510 Lacy Rd. 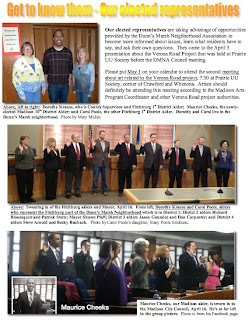 This hearing was covered in the 3/29/13 issue of the Dunn’s Marsh Neighborhood e-News. Madison Metro is proposing to eliminate some of the bus #18 service in the Belmar part of the neighborhood. Now the #18 comes into the neighborhood at Lovell Lane, turns down Allied and then east on Crescent. Then it goes north all the way up Red Arrow Trail. The proposed change would eliminate Allied/Crescent/Red Arrow Loop. For more information contact Ahna Bizjak, Transportation Engineer, at 270-4262. At its April 3 meeting, the Dunn’s Marsh Neighborhood Council took a position against eliminating the loop. This position was conveyed to Madison Metro by the DMNA Vice President David Kovach. Remember back in the fall of 2011 when a big liquor store was proposed for Madison Plaza near the Mobil Station? The neighborhood beat back that proposal. One of the points was that the neighborhood was already littered with alcohol containers from the one liquor store we have now on the Beltline Frontage Road. At the public hearing before the Madison Alcohol License Review Committee, we showed 2 bags of containers picked up along the frontage roads. The oldest member of the Dunn’s Marsh Neighborhood Council, Burree Bowdoin, in her 90s, died this past week. She had been a member of the Council since October 2011, attending quite faithfully until she fell at her home and broke her hip late in December 2012. Burree was active in politics, and had strong opinions candidates and about voting in elections. When voter picture IDs were required for one Wisconsin election, she did not want to be prevented from voting because of lack of a photo ID. I helped her get one at the Motor Vehicle Department and learned a lot in the process. This issue of the Dunn’s Marsh Neighborhood e-News started out as a notice to the owners of yowling cats and a howling dog, but obviously, it grew. Here’s the masthead, at the end rather than the beginning. We must be flexible, right?